2Wick, Dale; Johnson, Kathy; Evans, Jeff; Luna, Tara. 2001. Propagation protocol for vegetative production of container Dasiphora floribunda Kartesz., comb., nov. ined. plants (3L containers); Glacier National Park, West Glacier, Montana. In: Native Plant Network. URL: http://www.nativeplantnetwork.org (accessed 17 April 2006). 4Turner, Mark and Phyllis Gustafson. 2006. Wildflowers of the Pacific Northwest. Oregon: Timber Press, p231. 6Davidson, C.G. and L.M. Lenz. 1989. Experimental taxonomy of Potentilla fruiticosa. Can. J. Bot. 67: 3520-3528. 7Elkington, T.T. and S.R., J.Wood. 1963. Potentilla fruticosa L. J. Ecol. 51:769-781. 11Klackenberg, J. 1983. 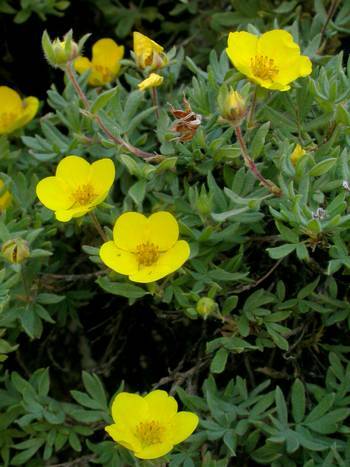 The holarctic complex Potentilla fruticosa (Rosasceae). Nord. J. Bot. 3: 181-191. 12Orloci, L. and W. Stanek. 1979. Vegetation survey of the Alaska Highway, Yukon Territory: Types and gradients. Vegetatio 41:1-56.